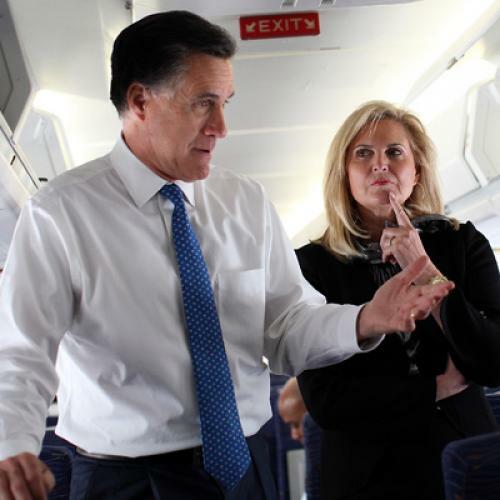 In the trenchant debate sparked by Democratic talking head Hilary Rosen’s comment about Ann Romney—the subject of front-page articles today in both the Washington Post and Wall Street Journal (what’s wrong, New York Times—you don’t care about mothers? )—we heard much about how highly Mitt Romney valued his wife’s work running the household, often saying it was harder work than his own. “I will tell you that Mitt said to me more times than you would imagine, Ann, your job is more important than mine,” Ann said on Fox News yesterday. So take that, Hilary Rosen. Ann can too relate to the woes of everyday women—husbands who deem certain diapers beneath their level, and stocks bequeathed by the CEO father-in-law, chip, chipping away.